Chickens raised at a family farm in Illinois. New USDA organic standards seek to set minimum requirements for outdoor time. 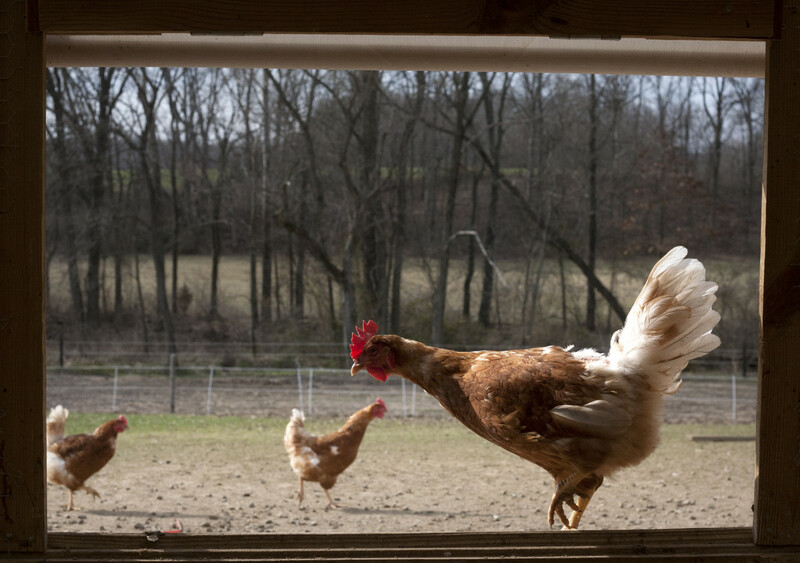 Daniel Bauenhoff, of Campbell Hill, stands among one of his several hundred chickens March 14, 2013, on his farm. Bauenhoff sells his eggs directly to the public. Chet Utterback, senior agricultural research technician at University of Illinois Urbana-Champaign, stands among the several thousand chickens he manages March 4, 2013, at the University of Illinois Urbana-Champaign poultry farm in Urbana, Ill. The U.S. Department of Agriculture has, for a second time, delayed the implementation of organic poultry and livestock standards. Four-year-old Marcus Miller holds one of his father's chickens March 14, 2013, at the family farm in Campbell Hill, Ill.
Chickens at the University of Illinois Urbana-Champaign poultry farm March 4, 2013 in Urbana, Ill.
John Miller walks across the lime covered floor of his chicken barn and steps out a small door into an open field in rural Campbell Hill, Ill. The fenced-in space is about an acre with a small creek and tree line on the other side of the chicken wire. Dozens of his 500 Hy-Line brown laying hens follow him. The temperature is in the low 40s and the wind is gusty, but the hens do not seem to mind. Miller’s farm just southeast of St. Louis is host to vegetable and strawberry fields and has ample parking set aside for visitors. Miller designed the barn so the chickens could get fresh air and that he would not be embarrassed if people came by to see where their eggs came from. Two hundred miles north of Miller’s farm, Chet Utterback stands at the end of a row of cages in a windowless, concrete-floored building. The University of Illinois’ laying barn is home to about 3,000 chickens housed in wire cages. Hens share cages and are allotted 78.8 square inches of space. Each row has three levels of cages with conveyor belts running in front of the pens for food and under to collect manure. The bottoms of the pens are slightly angled so that eggs roll out the front of the pens into a collection tray. Chet Utterback, senior agricultural research technician at University of Illinois Urbana-Champaign, picks up a chicken for inspection March 4, 2013, at the University of Illinois Urbana-Champaign poultry farm in Urbana, Ill. The building is one of two that house chickens. Set behind a chain-linked fence, both buildings are part of a small, eight-acre complex at the university poultry farm outside of Urbana, Ill. Visitors are greeted with signs warning about trespassing and bio-security threats. 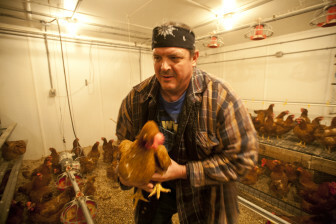 One man produces eggs in a free-range and cage-free environment. The other uses a traditional enclosed, caged system. Both men are proud of their operations and believe the egg production practices they use are the best. There is an on-going national debate as to which production method is better. Hen housing is the primary focus of proposed federal legislation that would replace current, state-level guidelines for housing and production practices. Utterback, manager of the University of Illinois poultry farm, thinks cage-free housing could increase the risk of Salmonella Enteritidis. “With the law that the Humane Society of the United States and United Egg Producers are pushing, for colony enriched housing like they have in Europe, those types of systems cannot be cleaned and can’t be maintained as clean as a conventional cage system,” he said. Salmonella E. can be transmitted several ways including through manure. Utterback worries that chickens not housed in conventional cages will scratch through manure and then become infected with Salmonella E.
“People tend to forget the reason we put chickens in cages in the 1950s was not only for the chicken’s welfare but from a human health standpoint,” said Utterback. But Miller says his cage-free operation is Salmonella free. As part of a pending contract to supply eggs to Whole Foods in St. Louis, Miller recently conducted voluntary Salmonella E. testing of his free-range, cage-free facility. Miller thinks his eggs are just as safe as any other egg sold today. To him housing systems are more of an animal welfare issue. The Egg Bill now in Congress is backed by an odd couple of interests – the Humane Society of the United States and United Egg Producers, the national trade association for the industry. The egg producers were forced into an alliance with the Humane Society after it obtained passage of a series of state laws with strict hen housing requirements. Enriched colony housing systems provide about twice the space as conventional housing systems. Hens would have a 4 feet by 12 feet space that offers scratch areas, perches and a nest box. Traditional cages are wire pens with no enrichments. Current guidelines require 72 square inches of space per bird. United Egg Producers and Humane Society of the United States again are trying to tie Egg Bill legislation to the Farm Bill - with mixed results. Originally introduced last year, the Egg Bill was tied to the 2012 Farm Bill. It died out when the Farm Bill failed. The Senate version of the Farm Bill that was passed in early June does not include Egg Bill language. However, there is still hope. The House version, which passed earlier in July, contains language that would block state-level legislation such as the California proposition two. The Denham-Schrader Amendment to the Farm Bill is the Egg Bill. The amendment was introduced to the House Agriculture committee by California Rep. Jeff Denham and fellow Californian Dianne Feinstein in the Senate. Currently the bill has 96 House co-sponsors and had seven in the Senate including Debbie Stabenow, chairwoman of the U.S. Senate Committee on Agriculture, Nutrition and Forestry. Last year there were 20 Senate cosponsors. Support comes from both sides of the aisle, said Chad Gregory, president and chief executive officer of United Egg Producers. With Egg Bill language in the House version of the farm bill, the Senate will be forced to reconsider the egg legislation in a conference committee, when all Farm Bill issues are negotiated. If Congress fails to pass a Farm Bill this year, the Egg Bill will be shelved and advocates will have to start over again next year. Eggbill.com, which is managed by United Egg Producers, has a list of Congressional members who support the bill. Many of the current and 2012 cosponsors listed were from California and other major egg-producing states; however, there were none from Iowa, the country’s lead egg-producing state. “Iowa is a very conservative state and is not a ballot state so they are not worried about the Humane Society coming in,” Gregory said. He said Iowa has a substantial pork industry and that Iowa congressional members do not want to upset their pork farmers. While Iowa isn’t a ballot state, egg producers there sell eggs across the country and in states that do have new guidelines pending, said Gregory. Gregory said the majority of egg producers, including the Iowa poultry association, support this legislation. He did acknowledge that not all in the industry support the bill. He believes differences within the industry about the Egg Bill are about housing and not an organic verses conventional argument. In addition to the Egg Farmers of America, the U.S. pork and beef industries, as well as the American Farm Bureau are opposed to the Egg Bill. Gregory said these organizations worry this would set precedence for Congressional involvement in animal welfare regulations, something they do not want. Gregory said he personally inserted wording into the Egg Bill that states other livestock or poultry operations are exempt from the housing requirements. Ohio, Michigan, Oregon, Washington and Arizona have adopted hen housing legislation since California adopted prop two. United Egg Producers sees federal legislation as a way to stop future battles over state ballot initiatives, most of which egg producers were losing. He said the Egg Bill would level the playing field between producers in different states. The 15 year deadline is a negotiated timeline. “We wanted 30 years and they [Humane Society] wanted five, in theory we settled between the two,” said Gregory. Utterback repeatedly said that consumers do not understand the ways their food is produced. Not all egg producers are backing the compromise. Egg farmer and pork producer Amon Baer of Minnesota said he decided to set up his own Washington lobbying group to fight the Egg Bill. Baer hired a D.C. lobbying firm to represent Egg Farmers of America. The firm also represents the National Pork Producers Council, the International Dairy Foods Association, Hormel and many other large agribusiness interests. 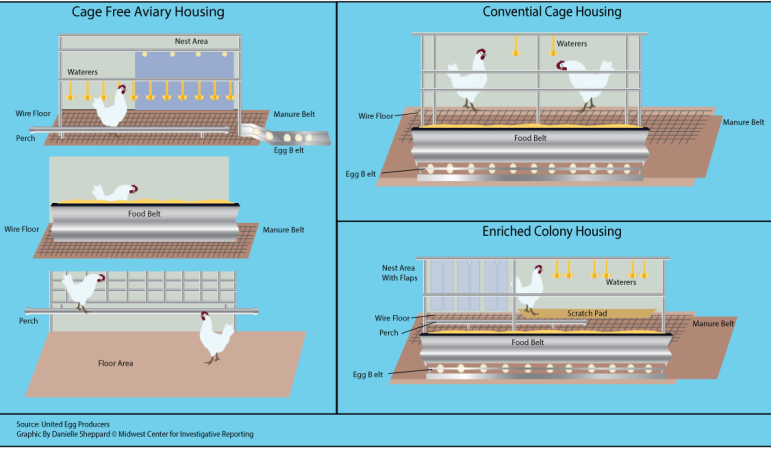 Egg Farmers of America issued a statement in February 2013 saying it feels there are both animal and human health concerns associated with enriched colony housing. One of the group’s press releases cited a report that stated: “Hens in enriched colonies experienced increased leg and wing fractures.” The release also cited a study that indicated Salmonella E. was transmitted at a higher rate in hens not housed in conventional cage systems. “I read an article that said Americans want a 100 percent full-proof, safe food supply and that is the most ludicrous thing I have ever heard of, there is no such thing,” said Utterback. Utterback also mentioned his concern about the costs incurred by producers to adopt new housing systems. He worries this would make eggs too expensive for consumers. Gregory of United Egg Producers thinks the costs will be manageable. The total cost to the egg industry for the enriched colony housing would be an additional $4 billion. Gregory said if the bill is passed consumers could expect to pay about 10 cents more per dozen eggs. But Egg Farmers of America does not agree with that projection. They cite an economic impact study conducted by the United Soybean Board that indicates a 25 percent increase in consumer cost. Another aspect of the Egg Bill would be to establish guidelines on induced molting of hens. Hens stop producing eggs and their ovaries “rest” and reset during a molt. Allowing a hen to molt will extend her egg-producing years. The average hen will go through at least one and probably two molts while in production. Years ago producers would withdraw feed and reduce the number of hours hens were exposed to light. Total food withdrawal was, however, linked to increased levels of Salmonella E. in some studies. Producers now use “feed-through” programs designed to reduce stress on the hen and thus reduce colonization of Salmonella E. in the bird. Regulating light exposure is still used, Patterson said. The Egg Bill would ensure the use of molting methods approved by animal welfare groups such as the Humane Society. Both Utterback and Miller have timers in place to regulate the number of hours of light in their laying barns. Animal welfare issues and views on consumer choice divide producers. Miller is a new producer. His barn, which is a custom design, was constructed in 2012 for about $25,000. He kept cost down by doing most of the construction with his oldest son. The barn has several special features to keep the chickens comfortable year-round. The barn is covered with thick, white plastic. Each side can roll up several feet to allow in fresh air. The sides have an inner wire wall to keep chickens in when the sides are up. The thermostat is set to control the air temperature in the barn. Cooling fans and the adjustable sides automatically engage as the temperature changes. Miller’s hens started laying at the end of September 2012. He gets more than 450 eggs a day from his cage-free, free-range flock. He is considering trying to become certified organic, but acknowledged it is a long process. His hens lay eggs in individual nests that have a plastic flap in front for privacy. Eggs roll out the back into a collection tray. There are perches in front of the nests, covered with chicken manure. This is one of the areas Miller made sure to swab as part of his Salmonella testing. Miller said that his chickens do run for cover when a large bird flies over. His hens usually hide in the barn or another small shed inside the fenced area when this happens. 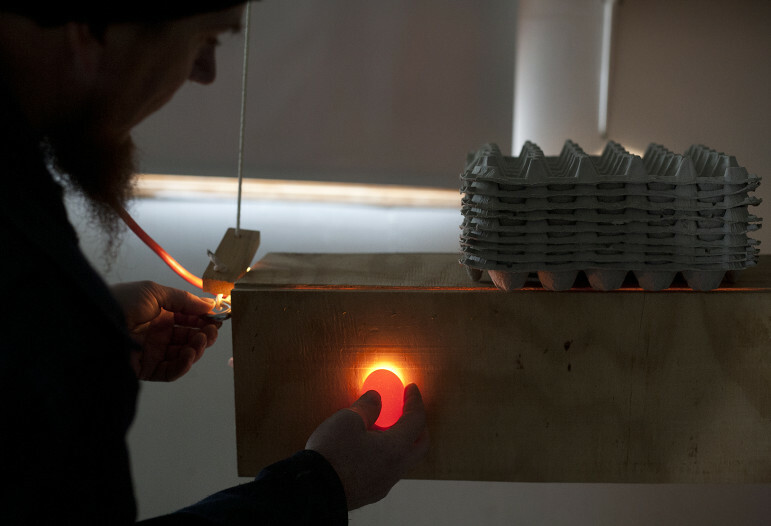 Using a homemade light box constructed of plywood, Miller candles all eggs as required by law before packaging them. His egg wash and packaging station is set up in his garage between the family’s deep freeze and carriage. John Miller checks an egg for cracks March 14, 2013, at his farm in Campbell Hill, Ill. Miller said if an egg has the slightest crack in it he has to discard it from sale. Eggs are stored across the road in a stand-alone refrigeration unit set between his strawberry patch and field where vegetables will grow this summer. A small building sets next to the cooling unit. Miller uses the building for administrative work when visitors come to the farm to pick berries or buy vegetables. Miller was also very open to showing any part of his operation to visitors. He had no concerns about photos being taken anywhere in his barn or of any of his birds. “I have nothing to hide,” he said. Utterback however, was quite concerned about photos taken in his University of Illinois facility. He said photos can be taken out of context and if people don’t understand the industry they might see something as mistreatment. “The only reason you were allowed in here is because I am a part of a public teaching institution, you would not have been allowed on another farm because of bio-security,” said Utterback. Birds at both farms were missing feathers. Miller and Utterback agreed that is just part of having chickens housed together in any system. The University of Illinois facility was completed in 2007 with a $3.2 million price tag. In addition to the breeding and laying hens, the farm has a small flock set aside for ovarian cancer research. Visitors that are allowed access to the laying barns must cover their shoes with booties so as not to track in foreign substances. If a person had been in contact with other poultry prior to visiting they would be required to put on a full-protective suit. The primary laying barn has a small area for administrative work and supply storage. Off that room there is a large cooler where eggs are stored. In the cooler there are several pallets of cased eggs. The cases are sorted by destination. Some of the eggs will be sold direct to consumers as part of the University of Illinois fresh egg sells program. Eggs that had been cracked or that did not meet standards would be shipped to a processing plant. “Breaker” plants take shell eggs, break them and then convert them into a processed or pasteurized egg product. The clucking of 3,000 hens is overwhelming when you enter the room of cages. The area is clean and the floors clear, but there is still a very distinct odor in the air. A student worker walks through the aisles gathering the eggs out of the collection trays. The poultry farm employees around 10 student workers and two full time employees. Utterback demonstrates how food is distributed on the conveyor belt in front of the cages. Hens group to the front of the cage when they hear the belt turned on. Water dispensers run along the back side of each cage. Paul Patterson, professor of poultry science at Pennsylvania State University, said there is conflicting data about the safety of colony enriched housing and free-range systems. He also said that as with most sectors of agriculture, the egg industry has seen a consolidation of farms. “Larger farms, larger companies with more sophisticated equipment are in place today. In 1976 there were 10,000 commercial egg producers in the U.S. and now there are less than 200. Producers that had food safety and animal or environmental issues have gone out of business. Patterson said the Food and Drug Administration, which has jurisdiction over shell egg inspections, is now challenged with how to handle free-range producers. Both can be predators of the hens, as well as possible Salmonella carriers. For eggs to be labeled organic the producer must register with the Agricultural Marketing Service and complete the certification process. This can take as long as three years and requires a great deal of paperwork on the part of the producer. Utterback had many concerns about the safety of eggs produced in any system other than traditional caged systems. He primarily cites the increased access to manure as the reason for his concerns. He also feels smaller producers are not as well regulated. Suzanne Moss, director of the Egg Inspection Program for the State of Illinois, said that all producers in the state, regardless of production method or number of hens, are licensed and regulated. Moss said the state does not have its own requirements for organic farms, which are certified by U.S. Department of Agriculture; however anyone who produces or distributes eggs in the state must have an Illinois license to do so. Inspectors from Moss’ office travel to the production and distribution sites to inspect prior to the original licensure and then on an annual basis. Moss further noted that applications have gone up each year and there are now more than 1,100 large and small licensed producers in the state.